“Attribution modeling” has become something of a buzzword over the past few years. So what is it, really? How can it help you as a marketer? In this post I’ll focus on how we can use Adobe Analytics to answer these questions. I was recently looking to buy a new hat. So I went online and searched for “Seahawks hat.” There were 871,000 options returned. I clicked through a couple of the links and wound up on the site I would later purchase from. At the time, I did not find the perfect hat; later I was catching up on my sports news and saw a banner ad for that same website. I clicked through and started to browse, but I was short on time and had to leave the site abruptly. A few days later, I saw a Facebook ad for the perfect hat — a nice snap-back with the old throwback colors. I looked at the web page and decided that was ‘The One,’ but it would have to wait. When payday came, I searched Google for the website and the exact hat I wanted. The hat appeared in one of the paid search ads, and I finally bought it. Now putting my analyst hat on (pun intended), which one of those channels should get the credit for my purchase? A. Organic search, for introducing me to the site in the first place? B. The display ad, for re-engaging me? C. Paid social advertising, for delivering the perfect ad for me? D. Paid search, for making it easy to find the hat again when I was ready to purchase? Attribution modeling is an attempt to allocate credit or value to each touch point in a customer’s path to conversion. Understanding and taking advantage of this concept can help you better determine the influence that each channel has on your bottom-line. That all makes sense in theory, but how about in practice? Let’s start by looking at two of the most common attribution models used today: Last Touch and First Touch. Advantage – When the visitor came to your site through the affiliate channel on the fifth visit, they were ready to make a purchase. Affiliate should get credit for finding and attracting that customer who was ready to buy. The Last Touch attribution model gives you an idea of which channels bring in customers who are ready to buy. Disadvantage – Even though it was affiliate marketing that was able to bring the customer in for the final visit where they converted, it was organic search that initiated contact with this individual. It ignores the fact that your SEO team was able to rank high enough to make it easy for the customer to find the site again, or the fact that your email team was able to nurture the customer and bring them closer to converting. The more touch points that exist between initial visit and conversion, the less accurate Last Touch becomes at allocating credit or value. In Adobe Analytics Marketing Channel reports, Last Touch is one of the two attribution models that you are able to compare. The campaign reports are generally set to Last Touch by default. First Touch attribution is also a very common model. As the name would suggest, it is the polar opposite of Last Touch attribution. It gives 100% of the credit to the first channel that brought in each visitor. Advantage – First Touch attribution helps you understand which channels are successful at bringing in new visitors. In the example above, without a successful SEO strategy, the visitor might have gone to a competitor’s site instead. Organic search played a pivotal role and should get some credit for this transaction. Disadvantage – By giving all of the credit to organic search, we are ignoring the fact that the customer did not actually convert for 4 more visits. Without those other channels it is possible this visitor would have moved on to another site. It is important to recognize the other channels that helped nurture and eventually convert the visitor. There are no default reports in Adobe Analytics that use First Touch attribution. However, if you have Marketing Channels set up, First Touch is one of the 2 attribution models that you can compare. contained within Typed/Bookmarked is all of my marketing efforts such as email, text alerts, vanity URL’s, etc. If you were to look at your Campaigns reports you will likely see a lot of “unspecified.” Contained within this “unspecified” bucket is everything that isn’t tagged as a campaign (e.g., emails, affiliates, social networks, etc.). Looking at these two reports, it becomes immediately clear that without Marketing Channels there would be no easy way to compare something like: email traffic with referring domains. Please note:Marketing Channels reports are not set up by default. Setting them up is a very involved process, which should be carefully planned because later changes are not retroactive. 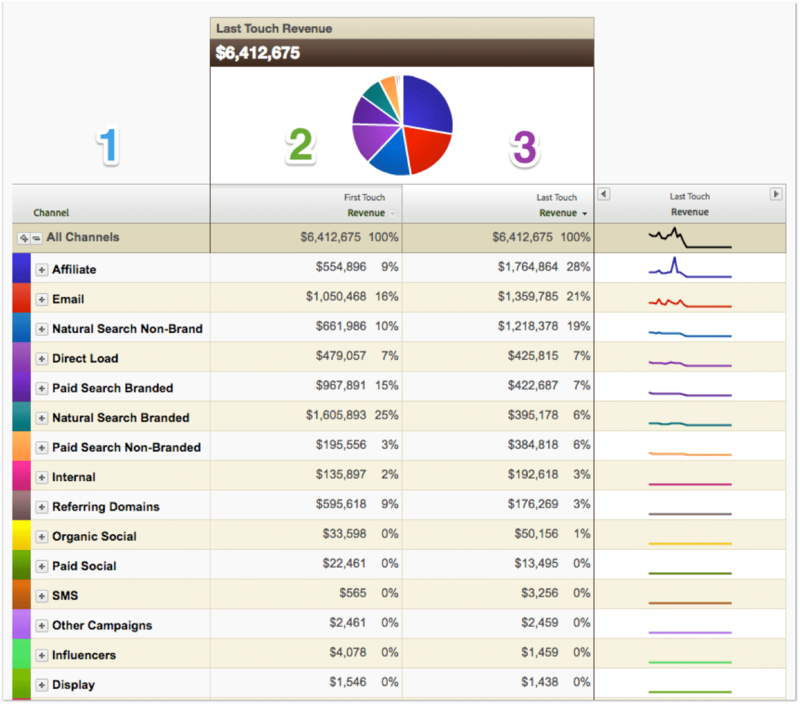 Let’s start with a look at the Marketing Channels Overview report. Column 1: The marketing channels that you have previously set up. Your default channels will be Paid Search, Natural Search, Email, Display, Affiliate, Social Networks, Internal, Direct, and Referring Domains, and you can specify up to 25 marketing channels. Column 2: Here we see how much revenue should be credited to each channel through first touch attribution. Column 3: Here we see how much revenue should be credited to each channel through last touch attribution. A quick glance at this report shows that there are some channels that look more or less flattering under the light of first or last touch attribution. To better compare these numbers, let’s open up the Last Touch Channel Report. Here we’ll utilize Adobe’s Calculated Metrics to create “First Touch Orders” and “First Touch Revenue” metrics. Finally, use Calculated Metrics again to create the following metric: Assisted/Last Click or Direct Conversion. This new metric condenses first and last touch orders into one simple ratio that helps us better understand where each channel succeeds. The closer a channel’s value gets to 0, the better that channel is at reaching customers who are close to conversion. A value close or equal to 1 means that channel does equally well at bringing in new customers up high in the sales funnel as it does bringing in customers who are ready to convert down at the bottom of the sales funnel. The further a value is above 1, the better the channel is at assisting conversions and bringing in new customers who are further away from conversion. With all of these values in one report we now have some brand-new insights. For example, we can see that based on the ratio of assisted to last-click conversions, Natural Search Branded is a clear winner in terms of First Touch attribution. If we were only looking at Last Touch revenue before, we would assume that Affiliate is our most profitable traffic source and we should put all our money into building that up. However, by doing that, we would be neglecting the fact that Natural Search has done a lot of the dirty work of attracting customers to the site for the first time. Understanding how each traffic source caters to customers in different stages of the sales cycle is an important insight that we can use to determine what type of content we want to present to visitors from those channels. For example, through our affiliate channel we can expect to have more success by presenting customers with clear calls to action that point to purchasing products or specific sales rather than reading our blog or getting to know our brand. Linear attribution splits up the credit equally between each of the marketing channels that contributed along the way to conversion. This means in the example above, each channel would get 20%, or one 5th, of a conversion. Advantage – Linear is a great way to look at the value a channel brings regardless of its position in the purchase process. It won’t matter if it was the first or last channel, it will get the same amount of credit. This method is an attempt to put every channel on an equal playing level. Disadvantage – One potential problem with linear attribution is that it rewards channels that appear in shorter conversion paths more than those that appear in longer conversion paths. This can lead to a situation where a channel that was a part of a two-visit conversion cycle resulting in a $100 purchase reportedly brought in more value ($50) than a channel that was a part of a five-visit conversion cycle resulting in a $200 purchase ($40). Depending on what your business model is, this may be a good thing or a bad thing. There are no reports in Adobe Analytics that utilize linear attribution by default. But if you would like to view your campaigns in terms of linear allocation and compare that to first and last touch attribution, you can utilize processing rules to copy the values present in the tracking code variable to two other eVars (conversion variables, in Adobese) and set their allocation settings to First Touch and Linear. Before I go into Full Allocation attribution, I should mention that this is not an actual report in Adobe Analytics that shows full attribution for conversions. Instead, it is a setting for Success Events. When you turn this on, you gain access to another metric. For example, if you turn on participation for Revenue, you will have a “Revenue” metric and a “Revenue (Participation)” metric. You can use this metric in conversion variable reports, the pages report, and other traffic variable reports for which you have enabled participation metrics. Full attribution is very similar to Linear attribution but with one key distinction: in linear attribution, each conversion is split up and divided equally between each of the touch points. Full attribution takes that single conversion and gives 100% credit to each of the touch points. In the example given above, each of those 5 channels gets one fifth of a conversion through linear attribution, whereas with full attribution, each of the five channels would get one full conversion. Advantage – Much like linear attribution, this model disregards what position the channel came in; it will get 100% of the credit either way. Also, it doesn’t matter how long the purchase cycle is. Channels that are part of long cycles will receive the same amount of credit as those that are a part of short cycles. Disadvantage – You may have noticed this already, but if you are handing out 100% participation ribbons to every channel, you are going to be double-counting your conversions. Full Attribution is not meant to be a means of looking at the exact number of conversions each channel was responsible for. Instead it is a way of looking at how many conversions each channel participated in (this is why the metric is called a participation metric). Time decay gives more credit to the channels chronologically closer to the actual conversion. You would want to use this when there are specific promotional periods that you want to give greater credit to. This is a combination between First Touch, Last Touch, and Linear. With this attribution model, more credit is given to the first and last touch channels, with the rest of the credit distributed equally between the remaining channels. 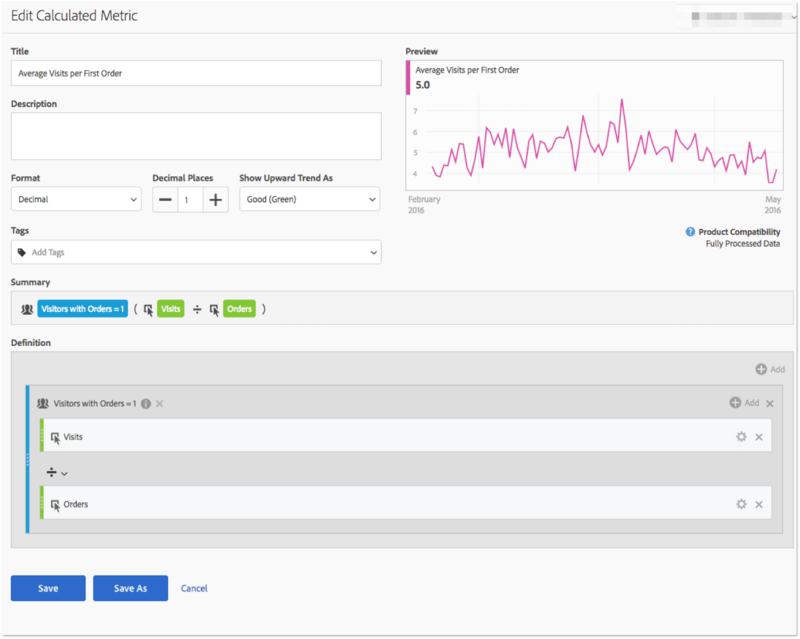 However, if you have Adobe Analytics Premium, you do have access to more advanced attribution models such as Time Decay, Position-Based, or Data-Driven/Algorithmic. What is the Best Attribution Model for You? Let’s start by determining what your typical customer journey looks like in Adobe Analytics. This will show us just the visitors that have made their first purchase (with some caveats, which I will address below). Once you have made this segment, you can create a calculated field that takes Visits divided by Orders. Once you have created this equation, segment it by the “Orders = 1” segment you created. In Adobe’s Analysis Workspace tool, drag the new metric you just created to the Rows section of the freeform table. Now for the caveat I mentioned above: if your date is set to only the current month, your calculated metric is only going to show those unique visitors who have made a purchase in that one-month time frame. Depending on your business, one month might not be ample time for your customers to make it all the way through the purchase funnel from initial visit to conversion. By only looking at one month worth of data, you are only including those visitors who found your website and were ready to convert right away. You’ll notice that as you increase the time frame, the Average Visits per First Order will increase. This is because you are giving the unique visitors in the segment enough time to make their way to their first purchase. Think about what your product is and make sure you are giving your unique visitors more than enough time. To be safe you can look at the entire life of your data. With this particular client, I know that one year is plenty of time. With this metric, we want to determine how many visits it takes, on average, to get a visitor make their first purchase on the site. It looks like the average for this website is about 6 visits. This tells us that just looking at the last touch channels will not be enough to fully understand the customer journey. To know what channels brought the visitor to the site for visits 1-5, you will need to look beyond last touch attribution. This is a critical point to call out here. Remember when I was looking to buy a new hat? I didn’t just show up on the site and make an impulse buy. My path to conversion involved multiple touch points along the way. We have just discovered that for this site, most of the customers do not convert on the first visit. In fact, on average they come back at least 5 times before they make their purchase. By using just First Touch or Last Touch attribution, you are failing to give value to 5 out of those 6 touch points. Before we move on, let’s dig in a little deeper. Search for the Visit Number dimension. 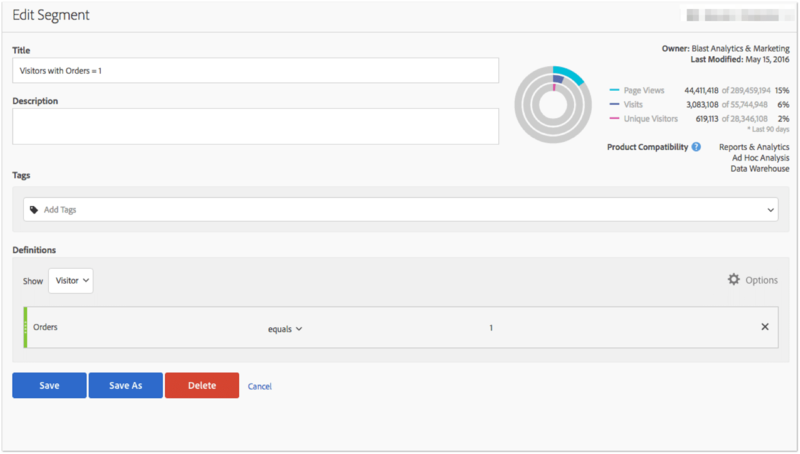 Drag that over to your freeform table along with the Orders metric and visualize the resulting table with a donut chart. It is likely that the #1 most common visit number for orders on your site is the first visit. We are looking for what % of orders came on visit numbers greater than 3. As you can see, close to 45% of all orders come from visit numbers greater than 3. What now? We have established that First and Last Touch attribution as seen through the Marketing Channels report will not be enough to fully understand the customer journey. 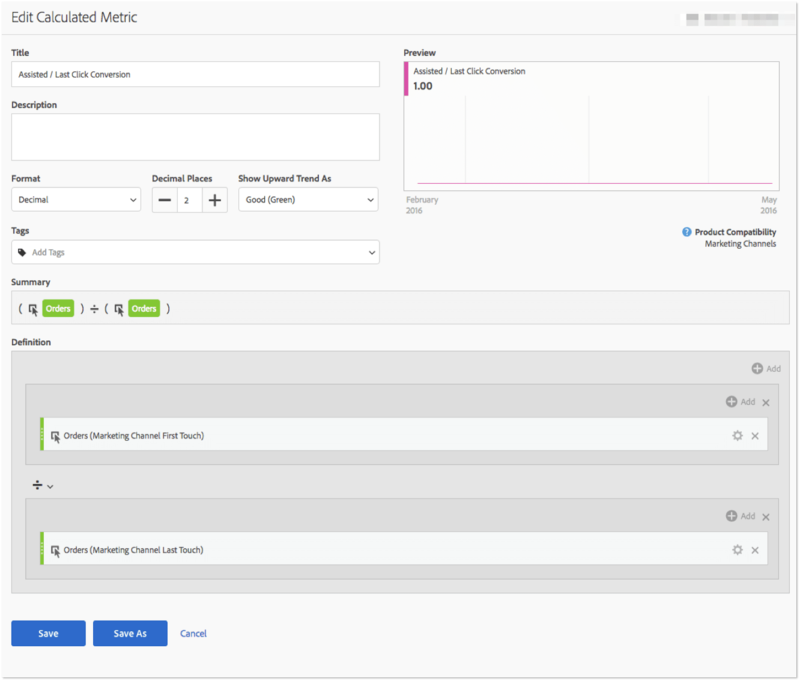 Unless you have access to Adobe Data Workbench, the only built-in attribution modeling you can currently report on is First and Last Touch attribution with Marketing Channels. However, it was recently announced at the Adobe Summit that plans are in place for a much more robust set of reports for Analysis Workspace, called X Attribution. These reports would provide a lot more information and appear to be very similar to Google’s attribution modeling reports. 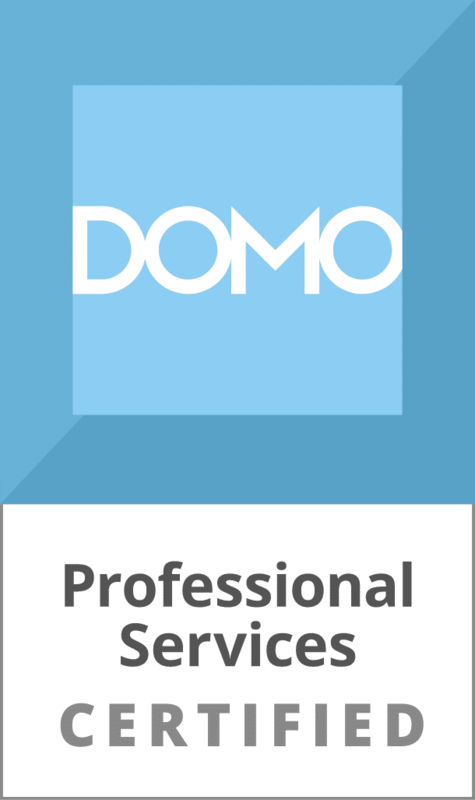 That said, there are a few things that can be done to get a rough idea as to what happens between First and Last Touch marketing channels without upgrading your contract to Adobe Analytics Premium. I mentioned the first two options earlier when I talked about Linear and Full Allocation. 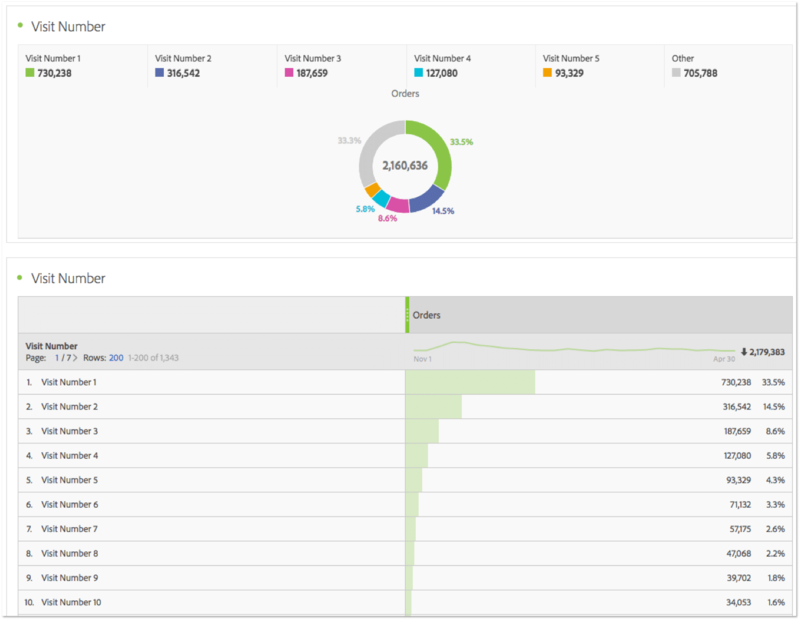 Participation Metrics – By enabling participation for your Order and Revenue metrics, you can add the “Order (Participation)” metrics to the Last Touch Marketing Channel report. This reveals how many orders each channel participated in regardless of position. By comparing “Order (Participation)” with Last Touch Orders, you can see how much a particular channel might be undervalued when looking just at Last Touch attribution. For example, you can see that in terms of Last Touch, Affiliate is pretty well-represented, whereas Natural Search Branded is very much under-represented. It is clear that Natural Search Branded participates in a large number of conversions even when it is not the last channel touched. Linear Attribution – If you were to duplicate the values in the campaign variable to other eVars, you could set them to expire after the same amount of time as the campaign variable, but then change the allocation to Linear instead of Last Touch. The effects of this change would be similar to using participation metrics, but one key difference is it would only be available for campaign values and not for full channels such as direct, search engines, or general referral traffic. Basically, it will only work for anything that has been tagged with campaign parameters. This may work for some, but others may find it to be too limiting of a solution. Cross-Visit Participation Plugin – There is a plugin for Adobe Analytics called “Cross-Visit Participation” (Sometimes called “Campaign Stacking”) that you can use to capture all of the channels that a visitor viewed before converting. On every first page of the visit, a value is set to determine what marketing channel brought the visitor to the site. Each time the visitor returns, the new channel is appended to the previous channels. Both of the last solutions (Linear Attribution and Cross-Visit Participation) are only options that will work with tagged campaign parameters. However, if you work with your developers, you can have them set the eVars to populate with similar rules to the Marketing Channels Processing rules. This way, you can see Linear Attribution or Cross-Visit Participation based on marketing channels rather than just campaign parameters. In the Admin settings, you should set this eVar to expire on your main conversion point (purchase, lead form submit, etc). This way the eVar will continue to gather marketing channels until they convert. As you can see, even though Adobe Analytics Standard does not have access to more advanced attribution models such as Time Decay, Position-Based, or Data-Driven/Algorithmic, there is still plenty of opportunity to better understand how each marketing channel is contributing to your overall conversions. Using the reports mentioned above, you will be able to successfully look beyond Last Touch attribution and better allocate credit to your marketing channels, as well as understand the paths your customers take to conversion. Terrific and very detailed writing Brad. 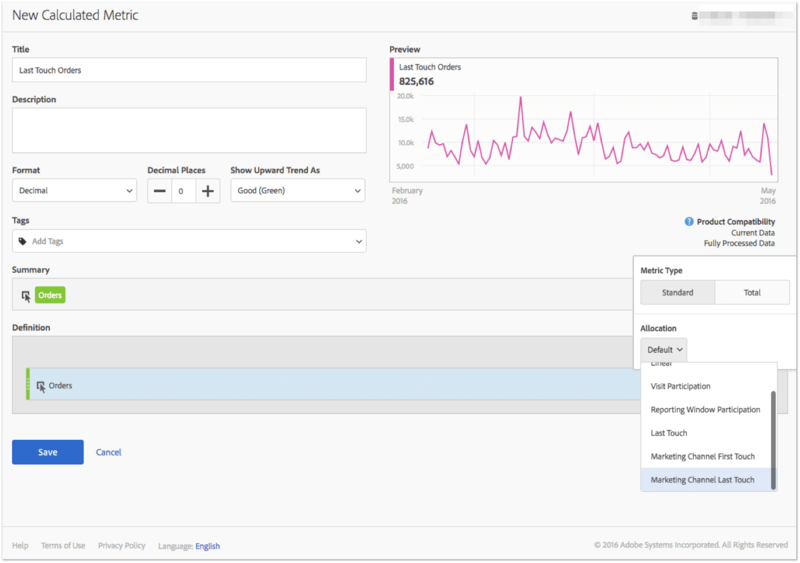 Would you say that Adobe Analytics attribution modeling is on pace with Google Analytics offerings? I’m curious about the pros and cons of each tool. Amazing post that summarizes the whole Adobe Analytics Attribution universum in a very readable way, thanks. One note I would have: You don’t need to activate particpation individually for Success Events, you can simply create Participation metrics on the fly with Calculation Metrics. What’s cool that it even allows for “Participation (Reporting Window)”, meaning that the Participation counts across Visits, something you can’t get in any other tool I know. So for example, when viewing the Campaign IDs and adding “Orders (Participation Reporting WIndow)” for a whole month period, every visitor that has every come through campaign ID in this month will be counted as contributing to this Orders. So you can analyze Reporting Window Participation, Visit Participation and the classic first- and last-click models in one report and this gets you, I think, a good enough feeling about the importance of each channels impact and where it stands more or less in the customer journey funnel. This even helps when linear eVars are not set up so you can see every dimension’s values that lead to a particular conversion event. That’s why I would absolutely recommend AGAINST activating Participation in the Admin Interface for Success Events at all because it is much better to have Participation when you want it and not have it when you don’t want to. If you activate Participation in the Admin INterface, you can’t have both anymore. And btw: both Participation forms (Visit and Reporting Window (called “Visitor” in Ad-hoc Analysis) have been available for a while in Ad-hoc Analysis. Thank you Jacob! At this moment in time I would say that Google Analytics has an edge over Adobe Analytics Standard when it comes to Attribution modeling. The main reason being that with Google you have access to much more in depth views of your data across models such as time decay, position based, custom models and you can even import different models from the gallery. They also have standard reports like top conversion paths and the multi-channel conversion visualizer. You can get some of this same information in Adobe Analytics but it requires a good amount of work and customization where these reports come standard in Google Analytics. The hope is with X Attribution Adobes reports will be on par with Google’s standard reports. When it comes to GA 360 vs Adobe Premium and data workbench, I’ll go more in depth on that subject in a future post so stay tuned! Thanks for reading Prolet! I definitely plan on posting something about Data Workbench in the near future. Thank you for your comments Lukas and for taking the time to read our blog! You make a great point about creating participation metrics on the fly by utilizing calculated metrics rather than using the Admin interface. This is an especially powerful feature that definitely would lead to great insights and help better understand the importance of each of your channels. FANTASTIC post Brad! Mind if I link to it from my blog? Wow, this is possibly the most useful post on Adobe Analytics attribution modeling I’ve seen. Thanks! Thank you for reading Randy! If you’d like to link to this post from your blog that would be great! Thanks Melissa! I hope it yields some great insights. I must you give amazing information on this topic because I am new at this I understand what you say in this blog. Keep sharing. Does the part related to the ratio still work? I can’t seem to create metrics that use the Marketing Channel First/Last Touch Allocation that are usable in any report other than the Marketing Channel Overview. When created, the Preview is not supposed and they don’t show up in either Analysis Workspace or standard reports (like the Last Touch Channel report you show). When the Order credit gets assigned to Campaign 1 through the Orders- Reporting Window Participation metric, will the order product name also be passed to Campaign 1? Or will the product be listed as “none”? thanks for the great ideas described in the article. As Mike already pointed out it looks like the ratio metrics are not coming LIVE these days anymore. Do have any idea or update for us on this issue please. Thanks in advance and congratulation on your great blog. I was so excited about trying this out, but my calculated metrics are not showing up for use in any reports. Why would this happen?